They had a pact. 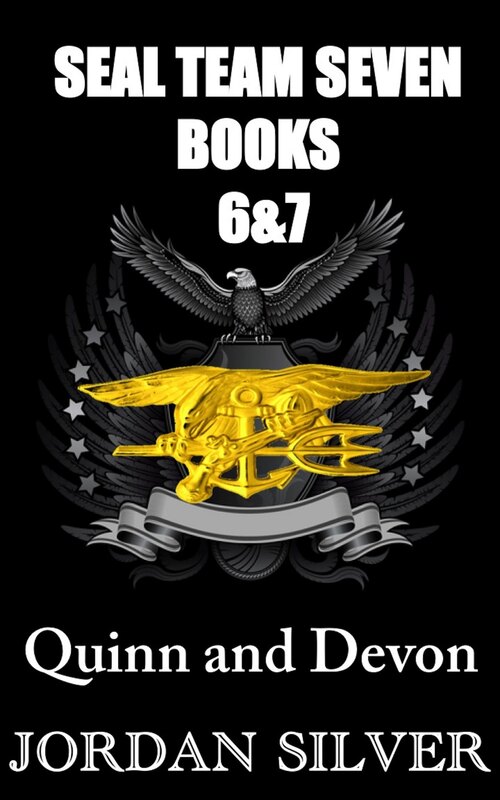 SEAL Team Seven, seven men who had formed an unbreakable bond while fighting to protect their country. None of them would marry until their service to home and country had been fulfilled. Now five of the brothers have found love, smack dab in the middle of them trying to chase down a madman who’s out to destroy them and everything they love. As the only two left standing, Quinn and Devon decided that their job now was to protect their brothers and their women. Though they got a kick out of watching the by-play between their brothers and their new sisters, neither man believed that life was for him. Quinn, who has a special gift that he keeps hidden from everyone but his brothers, didn’t think he’d ever fall into the marriage trap. What woman would saddle herself with someone with his history? Then in the middle of the night he’s awakened by his senses to the threat of danger. Since none of his family is in imminent danger, he can find no reason for his ‘gift’ to show up now. When the feeling persists, and he follows his mind, it leads him to the woman who would win his heart with just one look at her. When she turns out to be the daughter of one of his old commander’s closest friends, the mystery only deepens. Kelly knew that one day her daddy’s time in the Navy was going to come back to bite her in the rear end. Home from college for the summer, she’s looking forward to some relaxation in the small town where she’d been born and raised, after the hustle and bustle of the city. But that all changes when she’s snatched and dragged across three states. She doesn’t know what’s going on but she knows one thing, she’s not going down without a fight. When she sees the figure off in the distance on the beach as her kidnappers are dragging her into the fog, she makes a run for it, and right into the arms of her destiny. Devon’s getting a kick out of the way his brothers had all fallen. Then his new sisters started whispering behind their hands and keeping him in their sights and he knew they were plotting his demise. Thankfully he and his brothers were embroiled in a dangerous game of cat and mouse that helped take the heat off. After they rescue Quinn’s woman from traffickers on the beach, she’s overheard mentioning another grab the kidnappers have planned and they head off to California to rescue the son of another one of the commander’s old team mates. Only when they get there there’s a surprise waiting. A surprise that will turn Devon’s world upside down and make him question the life he’d had planned for himself. Ariel Samson is a woman of mystery. Raised in secret her whole life, she doesn’t show up in anyone’s database. The men and their friends who have banded together to help them take care of the threat are left scrambling to put the pieces of who she is together. i order a book from your book corner name breeder and paid for it .i have not receive this item#5318. Send me my book or refund my 3.99 payment. It shows that you ordered this book 10 days ago can you tell me what happened when you downloaded the book? And please tell me what device you are using to read on I’ll be more than happy to help you download the book. Yeah can’t wait to get it.